When I look at the forecast and see that a substantial amount of snow is expected in the next 24 hours, my heart skips a beat. 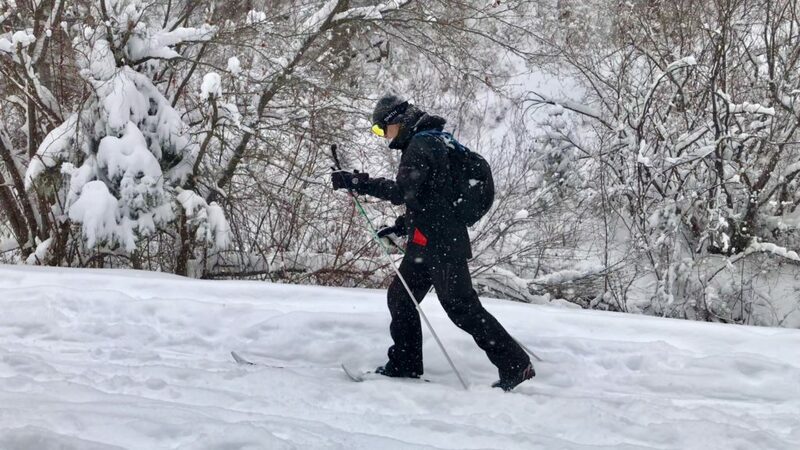 Northern Utah’s snowfall has been abnormally low in recent years—and the prospect of a storm is thrilling. We saw very little precipitation from November to January last year, making ski resorts scramble and winter snowsports across the state bleak. 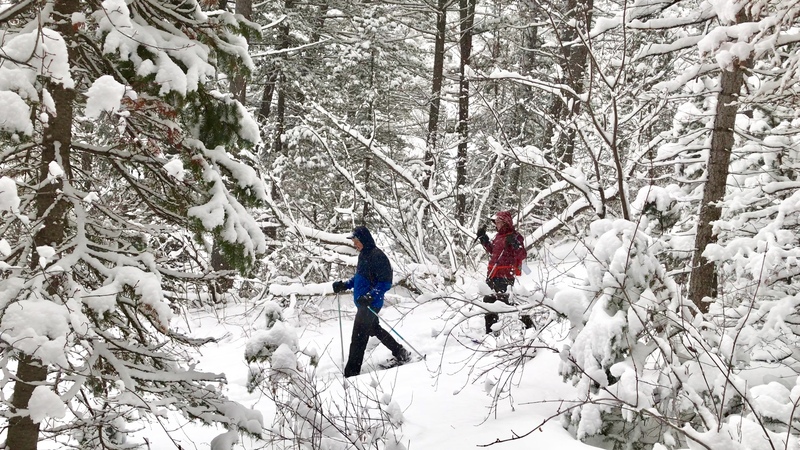 In mid-February, as I was prepping for an overnight hike with some friends, the storm looked promising, and our Nordic skis were begging for some fresh powder. 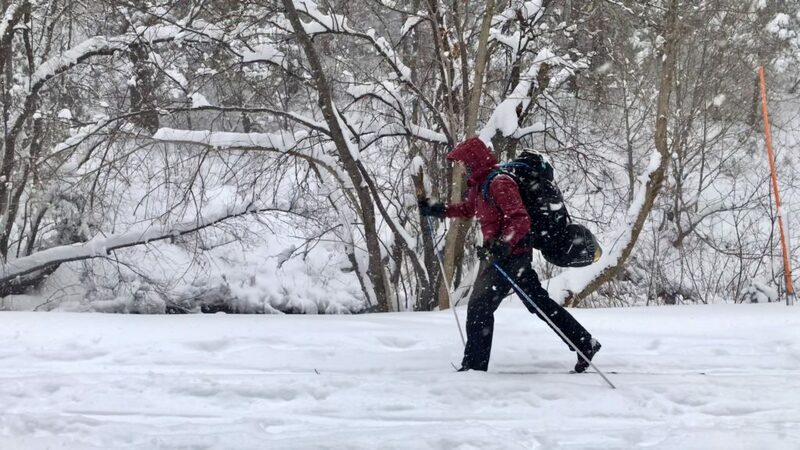 We set out mid-morning up Millcreek Canyon with skis on foot, poles in hand, and packs outfitted with gear for backcountry yurting—in what looked to be an epic snowstorm. I had done this trail before, but it had been a few years, and I hadn’t entirely remembered how much my legs would burn at the uphill climb. 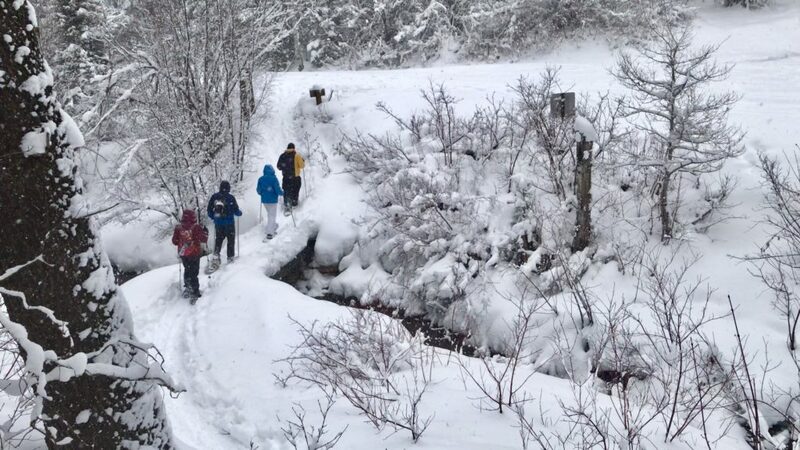 From the winter gate at Maple Grove Picnic Area, we trekked 4.5 miles up the canyon. Even though the air was in the 20s, we worked up enough of a sweat to shed some layers. We remembered there being a steep final climb and a sharp turn at the very end of the trail, opening up to a flat area that is a parking lot in summer, with the yurt nestled in the pine trees. At one point, we thought we were at the base of that steep final climb and jokingly wrote in the snow for our friends behind us, “You’re almost there. This way!”. We huffed our way up that steep climb and turned the corner only to see the trail continuing on. The joke was on us. The author backcountry yurting at Big Water Yurt in Millcreek Canyon. 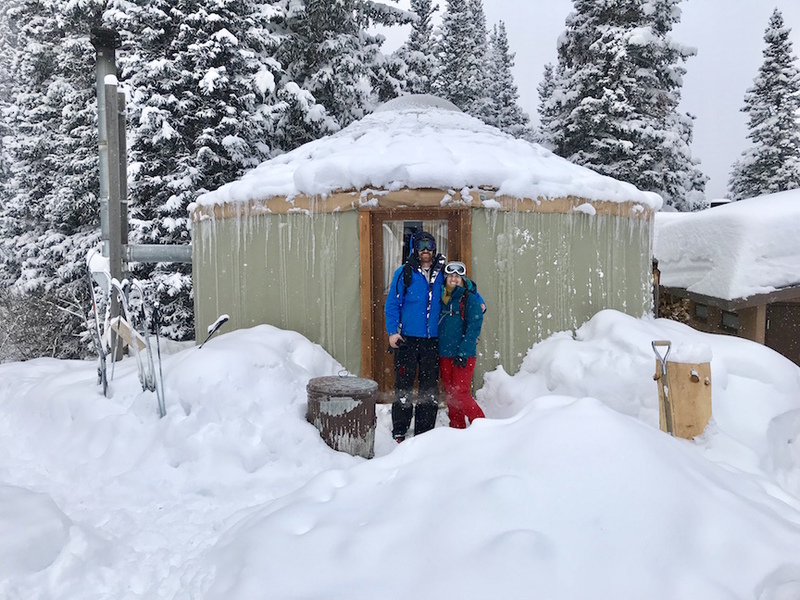 With the snowfall getting heavier, we made it to the Big Water Yurt. We got to work getting out of snow gear and wet layers and firing up the stove for warmth and dinner. The temperature inside the yurt was below freezing, and our impatience made it feel like we’d never get warm. But soon enough, the fire was roaring and we were scooping snow into our tea kettle to melt for making dinner. We feasted on stovetop stuffing, instant potatoes, and canned chicken in gravy while we spent the evening playing Phase 10 and Uno by firelight. Outside, the Wasatch Mountains were getting their heaviest snowfall so far that season. It’s exactly the kind of night that warms this Utah girl’s heart. The night was not entirely uncomfortable, but every hour or so someone had to get up and add wood to the fire. It’s an interesting dance that takes place all night: add fire to the stove and at its peak, the fire warms up the yurt enough that we all unzip our bags to cool off, as the fire dies down you zip up and sink deeper into your bag. Soon it gets cold enough that someone takes one for the team and gets out into the crisp air to add wood and stoke the fire. Repeat six or seven times. You all take a turn and feel not totally rested in the morning, but when it’s your turn to tend the fire, you just slip on your boots and go outside, taking in the falling snow and the moonlight casting colorful sparkles on the crystalline snow. It’s a magical way to spend a night. In the morning, we lazed around reading or chatting while snow melted in the tea kettle to make oatmeal and tea for breakfast. When it was time to go, we packed up our gear and went outside to find the night had graced us with over two feet of fresh powder. We restocked the firewood in the cabin for the next tenants and strapped on our skis. What took us 3.5 hours the day before took us 50 minutes to get back down. 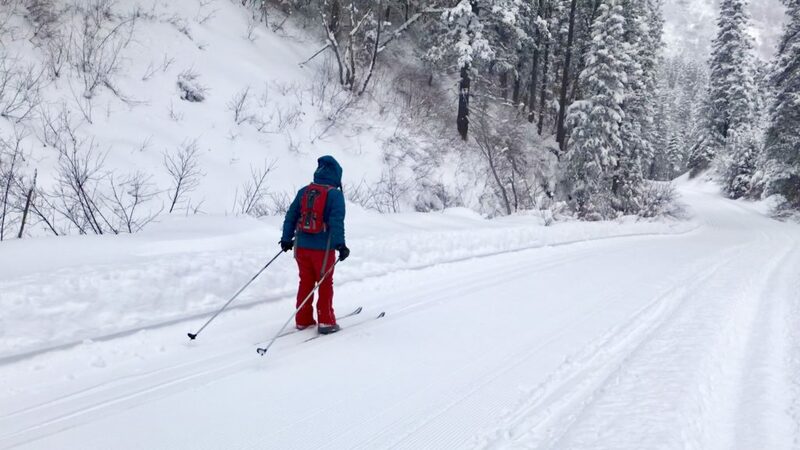 We all beamed smiles as the trees whirled past and we made new tracks in fresh, unadulterated snow. Beyond the fun that you can have snowboarding or skiing at the resorts, there’s a host of activities to enjoy during winter months, even if it takes a little bit more planning and preparation. Big Water Yurt offers a true backcountry experience without journeying far from Salt Lake City. Just be ready for possibly falling even more in love with this playground that we live in; it’s just as alive in winter months as it is in the summer. Big Water Yurt is located in Millcreek Canyon and is open from December to April. Reservations are required and can be made online with Salt Lake City Parks beginning every year on November 1 at 8:00 a.m. Reservations fill up quickly, but cancellations do occur, so keep watching the website for openings if you’re not able to get one initially. The yurt is supplied with a potbelly stove, four double bunk beds that sleep up to eight people, a picnic table, vault toilet, and firewood. When packing for backcountry yurting, bring a sleeping pad, sleeping bag, lightweight food, plenty of water, a headlamp, and comfy clothing and outdoor apparel. Wear layers. 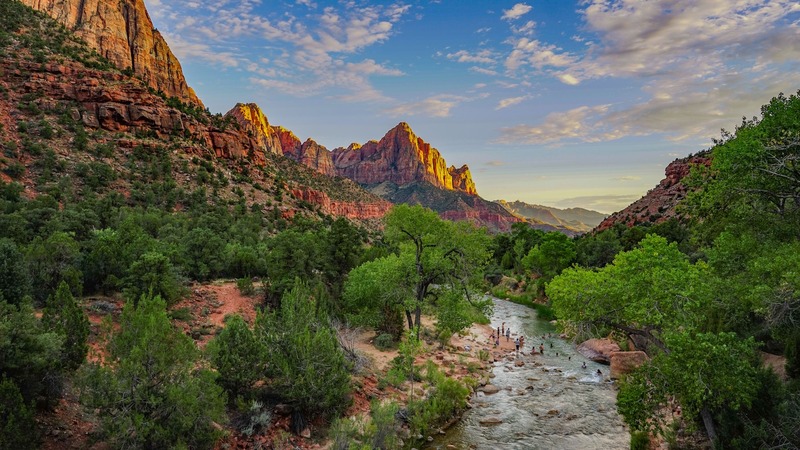 You’ll warm up quickly hiking in, even when the air temperature is low. Don’t expose your skin too much to the cold air, but wear layers that you can remove when you work up a sweat. Don’t overpack! As with all backpacking ventures, come prepared and don’t under-outfit yourself for backcountry yurting, but be judicious about your selections. Even a few extra pounds of weight will really slow you down. 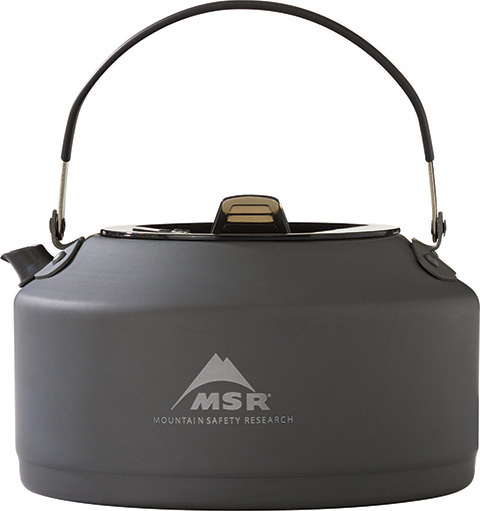 Try “tea-kettle cooking.” It’s not glamorous and likely not that healthy, but tea-kettle meals are uncomplicated and lightweight in a pack. Try Cup-of-Noodles, pre-cooked pasta and rice, ready-to-eat Indian food pouches, tuna fish packets, instant soups and oatmeal, and pop-tab canned meats (so you don’t have to carry a can opener). Stay warm. One of my favorite tried-and-true tricks for camping in cold weather: warming back patches. Intended to help ease muscle pain, these patches work via a chemical reaction once you take them out of their package, and give you 8–10 hours of heat right to your core. On cold camping nights, adhere one to your lower back or abdomen, sink into your sleeping bag, and enjoy a full night’s sleep without worrying about getting too cold.